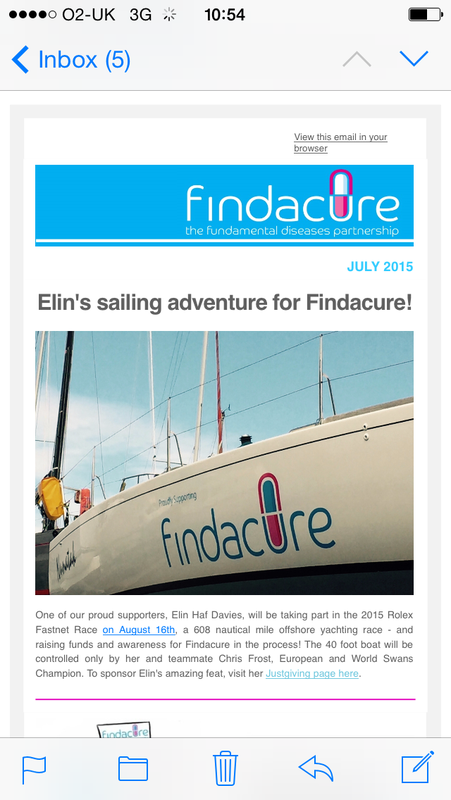 Elin Haf Davies: Why Findacure? A week on Sunday I’ll be taking part in the 2015 Rolex Fastnet Race; a 608 miles yacht race on a 40-foot boat (J120 Nunatak GBR9604R) with just two of us on board. I’m obviously doing this as a personal challenge, but I’m also doing it to raise awareness for a charity that I feel passionate about: Findacure. Over the last eight years I have been extremely lucky to be able to pursue both my professional ambitions and my adventure dreams. In 2007-8, along with fellow nurse Herdip Sidhu our row across the Atlantic Ocean raised £190,000 for metabolic research. Money that allowed Dr Emma Footitt Metabolic Consultant at Great Ormond St Children’s Hospital to take three years out of clinical work to study for a PhD; exploring the value of a Vitamin B6 derivative to manage a rare disease (PNPO deficiency) that causes neonatal seizures. Since then, Emma and I have collaborated closely on developing her work further. In October 2014 we were granted OrphanDesignation for PNPO deficiency by the European Medicine Agency (EMA), and in July of this year our proposed development plan to develop a new formulation, and to evaluate it’s safety and efficacy were assessed by the Committee for Medicinal Products for Human Use (CHMP) at the EMA. But most importantly, our proposal is through to the final stage of assessment for a €4.2 million grants from the European Commission (Horizon 2020) to fund all the work. And although our hopes are high in being awarded the grant, we’re aware that even getting through this far in the assessment process against tough competition is an achievement. When we start on a journey we honestly can’t imagine what long-term outcome can come of it. When I reflect back on all the negativity we faced before we embarked on our Atlantic campaign – “you’ll never do it”, “you’ll die!” – let alone the difficulties in finding the sponsorship to fund the campaign, I can honestly say now that it was so worth it on a personal and a professional level. Findacure is dedicated to finding cures for rare diseases using the same approach that’s used for PNPO deficiency – drug repurposing. In simple terms that means using currently available medicines for different conditions. With an estimated 6000 rare diseases there are approximately 32,000,000 patients in Europe that live in hope of finding a treatment option. The approach by Findacure also encompasses the development of patient support groups as a cornerstone of the drug development approach. I was also thrilled to work with Findacure to run Cross Your Own Ocean workshops for young people with rare diseases thanks to funding from BBC Children in Need. 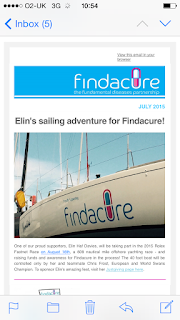 Developing new treatments and supporting patient groups has been the two main aspects of my professional career – which is why therefore I proudly support Findacure.